Amatrol’s 950-GEO1 Geothermal Energy Training System enables learners to understand and apply their newly obtained technician skills in the ever-growing area of geothermal energy. This training system builds knowledge as well as skills across a broad spectrum, ranging from system startup and operation to shut down and maintenance, in a readily accessible, compact vertical trainer. Harnessing geothermal energy is rapidly increasing in importance as a tool in broadening the energy supply. Designed as a teaching system, this learning system showcases components, often not visible in actual installations, on a vertical panel that permits easy access for hands-on skills and observation. Amatrol includes a ground simulator so that learners gain realistic experience using a continuously operational system like they will experience on an installed system. Amatrol’s Geothermal Learning System packs a residential-sized system into a 6-ft. (1.83 M) long mobile system that easily fits through a standard door. Major components include a 2-stage compressor with a 2-ton heat pump, ground simulator, air duct with ECM blower, ground source loop, and industrial grade geothermal controller. These components and many more come standard on the 950-GEO1. Industry Standard System Components and Features! From its 2-stage compressor and 2-ton heat pump to the ground source loop that includes a flow center and a header loop, Amatrol’s 950-GEO1 Geothermal Energy Training System delivers features commonly found in installed geothermal systems but often excluded from training systems. These include a variable speed ECM air blower, water coil heat exchanger, sight-glasses at many points in the system for observing the refrigerant cycle, ample temperature and pressure monitoring, electrical test points, ground simulation, and even the high-density polyethylene pipe specified for use in installed geothermal systems. These technical components are clearly labeled and mounted for easy observation on a vertical panel, allowing learners to easily observe and evaluate system operation and performance. Ground Simulator Allows Continuous Energy Training! Amatrol includes a custom-designed ground simulator with the 950-GEO1 to act as a realistic heat source/sink that can operate continuously. Amatrol’s ground simulator creates a sustained, temperature-controlled environment that accurately replicates the constant temperature found underground. A digital, programmable temperature control unit is used to set the ground simulator to the desired temperature which enables accurate data collection. Systems without a temperature-controlled ground simulator are not able to deliver consistent, accurate data collection because the geothermal system’s ground loop is constantly transferring energy to and from the heat source/sink. The 950-GEO1 Geothermal Learning System includes feature-rich interactive multimedia curriculum that enables learners to move from an introduction about geothermal energy to overall system performance evaluation. Learners begin with an introduction to geothermal heat pump systems and move rapidly into the concepts and components that make a geothermal system operate; these include closed-loop circuits, compressors,closed-loop circuits, compressors, condensers, evaporators, metering devices, refrigerants, suction line accumulators, receivers, dryers, moisture indicators, thermostats, controllers, blowers, heat-pump system start-up and operation, and overall system performance. Through partnerships with key industry leaders and leading edge educators in the area of geothermal energy, Amatrol developed the right balance of knowledge and applied skills needed to work with geothermal systems. 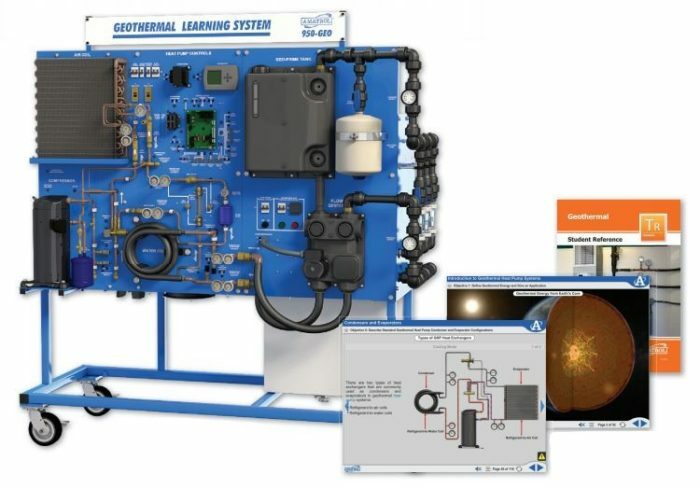 The 950-GEO1 Geothermal Learning System puts learners on a solid path to obtaining the International Ground Source Heat Pump Association (IGSHPA) certification as well, providing excellent foundation in topics such as startup and checkout procedures, flushing, purging, and charging the system. Need to Teach the Operation of a Desuperheater? Check out the 950-GEO1D! The Geothermal Desuperheater Learning System (950-GEO1D) offers all of the skills and curriculum of the 950-GEO1 but with the addition of a desuperheater system. A desuperheater uses the excess energy from the geothermal system to heat water for little or no additional cost. Additional topics include the operation, startup, shutdown, troubleshooting, and maintenance of a desuperheater system. Powered by FaultPro, Amatrol’s premier electronic fault insertion software for teaching hands-on troubleshooting skills, the 950-GEO2 Geothermal Troubleshooting Learning System comes equipped with all of the material in the 950-GEO1 with the addition of 28 electronic troubleshooting faults. These faults include electrical, mechanical, and fluid-based faults designed to help the learners practice applicable industry skills and troubleshooting any problems that may occur in a geothermal system. Hands-on troubleshooting is where a learner’s geothermal knowledge is truly put to the test! The 950-GEO2D adds the desuperheater and additional faults to related to its operation.